In 1995, two United States Department of Agriculture (USDA) revitalization Rural Economic Area Partnership (REAP) Zones were created in southwestern and north-central North Dakota. They were created to address critical issues related to out-migration, constraints in economic activity and growth, low density settle¬ment patterns, stagnant or declining employment and isolation that led to disconnection from markets, suppliers and centers of information and finance. 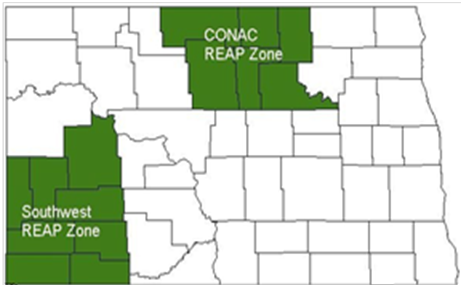 The two North Dakota REAP Zones were called the Southwest REAP Zone and CONAC (Center of North America Coalition for Rural Development) and implemented through a Memoranda of Agreement signed between the Zones, U.S. Senator Byron Dorgan and USDA Rural Development. The pilot project established a collaborative and citizen-led effort to enhance economic development in the two REAP Zones. Including the Turtle Mountain Band of Chippewa and the Spirit Lake Reservation located in this area.